If you look really closely at the footnotes in the Declaration of Independence, you'll see that when Thomas Jefferson wrote his little jam about life, liberty, and all those unalienable rights, he assumed the right to having your face laser etched onto a ham was already implied. Our government has cruelly ignored TJ's dream for years, but freedom fighters Dietz & Watson have finally stepped up to the plate to undo 237 years of injustice. Ladies and gentlemen, we give you the LaserHam. This miracle of meat and science came about thanks to Twitter. 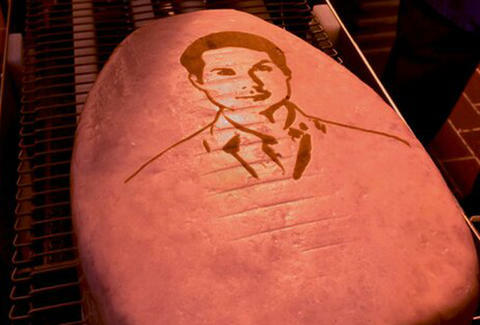 Michael Ian Black, whom you might know from his stints on Wet Hot American Summer, The State, and every Vh1 nostalgia fest ever, tweeted his wish for a laser that etches your face onto a ham called LaserHam. 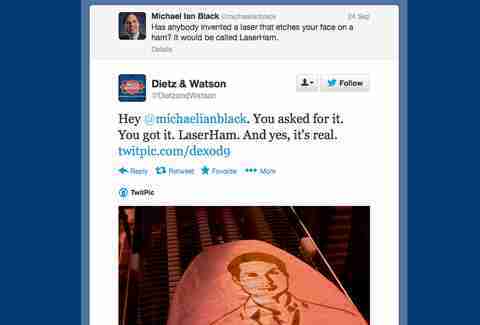 Dietz & Watson sneakily went back to their labs, put the guy's face on a sizeable ham, and then tweeted him back the evidence the next day. It sounds like the Speedo'd king of Twitter Rob Delaney may be next, so start working on that Klout score if you want a shot at your own LaserHam.